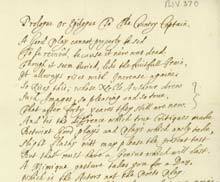 The Portland Literary Papers and the Cambridge Drama Collection, together with other manuscript and published resources, provide rich scope for the study of dramatic works, actors and the history of the stage from the early modern period to the late 20th century. Thomas Shadwell composed a speech to honour William Cavendish, 1st Duke of Newcastle, when Cavendish's play 'The Country Captain' was revived, probably about 1690. The play had first appeared without attribution in 1649. Such prologues or epilogues were common additions to performances. The manuscript is just one of many original texts preserved in the Portland Literary Papers, part of the Cavendish Bentinck family archives. 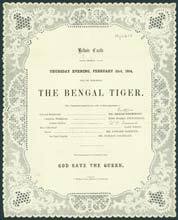 'The Bengal Tiger', a farce by the playwright Charles Dance, was performed at Belvoir Castle, Leicestershire by an amateur company in 1854. The staging of plays was a tradition of English country house parties in the 19th century. Family papers occasionally preserve printed playbills recording special productions. 'The Bill of the Play: An illustrated record of the chief dramas, plays, operas bouffe etc.' was edited by J. Higden Thornell. It gave the London theatregoer of 1881 a comprehensive view of recent attractions, with summaries of the plots, notes of critical reviews, and details about the productions.